According to ChartCraft’s Investors Intelligence survey, 40.4% of newsletter editors are bullish, while 31.5% are bearish. This ratio of bulls to bears takes us back to where we were in mid April 2009. The US retail investor, as measured by the weekly AAII survey, has recovered quite well from the shell shocked state we found them in in early March 2009. In that sentiment overview, the AAII put in a new record bearish extreme with 70% expecting further declines in the stock market. Since then, they have recovered 37% points - that’s more than half. So this week we are seeing a similar sentiment picture from the AAII survey: 44% bullish and 33% bearish. Check the link to see the only two other times in the history of this metric that we had seen such an extremely gloomy outlook from retail investors. And finally, the AAII equity allocation jumped from 41% to 50% of portfolios. Most of this increase is coming from a reduction in cash holdings. While this may seem negative, it is required. Unless investors allocate more capital to equities, how can it appreciate? At the same time, the current allocation is still historically low; equal to late 2002 and early 2003, as well as early 1991 - all great times to jump back into the market. 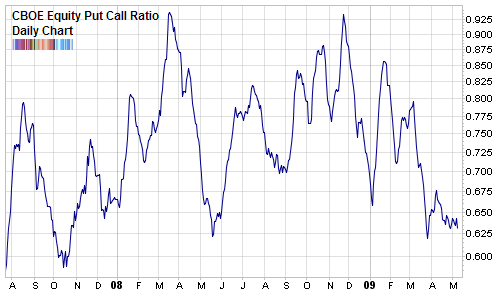 The short term moving average of the CBOE put call ratio is about as low as in May 2008 - which was just before the market rolled over again and cascaded down into the November 2008 lows. The previous high in this ratio occurred on December 30th 2008 (234) when the Santa Claus rally hit the wall. But notice that the high call buying cluster in mid April didn’t seem to faze the market in the least. The options market remains the one sentiment measure that has been strangely affected during this bear market. Maybe I’m not reading it correctly or maybe something structural has shifted. Either way, I’m growing wary of giving too much weight to it. After falling to a 6 month low in mid April, the CBOE Volatility Index (VIX) continues to drip lower. It is now below both its long term (200 day) and medium term (50 day) moving averages. As I pointed out before, while the VIX has been acting lethargic in comparison to the sprightly S&P 500, it seems to be begrudgingly confirming the rally. While the VIX is saying that the market volatility is lower now than before, it doesn’t really feel that way to those that watch the tape every day. That’s because the market is just as volatile. As Mark Hulbert points out, if we count the number of days in which the market has risen or fallen 1% or more, it becomes apparent that we’ve seen as many of these ‘volatile’ days now as before when the VIX was almost three times as high. As mentioned before in a previous sentiment overview from a few weeks back, corporate insiders have started selling their company’s shares at a rapid pace. It is hard to believe but they’ve picked up the pace since then and pushed the ratio of sales to buys to a fresh highs. There is a change in the air. Investors are venturing out of their bunkers and taking on some risk. Equity mutual fund flows is now at a rate to be $8 billion for the month of May. While this may appear to be bad news, from a contrarian point of view, we have to keep in mind that any sustainable rally in the market requires fresh funds to fuel it. As well US junk bond funds saw an $822 million inflow this week. So not only are investors taking on the kind of risk that comes with equity ownership, they are suddenly showing a very healthy appetite for the much more riskier asset class of junk bonds. Once in a while I like to check in with the Grey Beards, the investment professionals that have seen more market action than most of us. Right now, they are for the most part bullish. Doug Kass of Seabreeze Partners, Jeremy Grantham of GMO and Richard Russell of Dow Theory Letters. Each of them has acknowledged that we are transitioning out of a bear market into a bull market. Some of them, like Russell, very grudgingly. By the way, I recently added Grantham’s latest client letter to the Free Trading Resource section (under Reports & Articles). This is it, down to the wire. Last chance to get your hands on the 120 page FREE report from Elliott Wave International is only valid for a few more hours. It is a mini-book covering the US, European and Asian markets as well as interest rates, commodities, currencies and much more. Just a few more hours left in the offer and then you’ll have to shell out clams to get it. A 10 second email registration and you’re set to download your copy. Do it right now because this is your last chance. S&P is currently 929 vs 874 in the Coppock Guide article, would you give your view how likely the market will go straight up without a correction as more people and indicators are turning bulls? Paul, my crystal ball is a bit fuzzy right now but using options data you can calculate the probability that the market puts on the S&P 500 staying above 874 by month’s end.